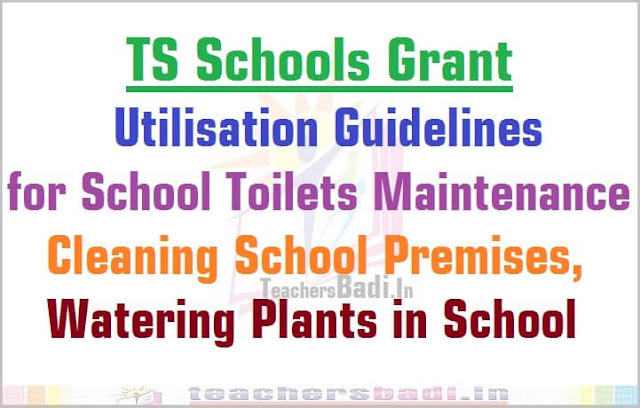 TS Schools Grant Utilisation Guidelines for School Toilets Maintenance, Cleaning School Premises, Watering Plants and Engaged Person Remuneration: Guidelines on School Grants including engaging the services a person in Schools for maintenance of Toilets, cleaning of School premises. watering of Plants etc., and Job Chart, Engaged Person Remuneration, Schools Toilets Maintenance Grant Utilisation Guidelines,TS School's Engaged Person Remuneration. The Telangana Government has taken adequate measures to ensure provision of boys and girls toilets in all the Government and Local Body Schools in the State. Sanitation facilities are foremost important in maintaining health & hygiene and for overall development of the students. Further, the Government has also taken a prestigious programme "Telanganaku Haritha Haram" and saplings are being planted in all the Schools in the State. In order to sustain the Sanitation facilities in the Government Schools and also to water the plants in the School premises, necessary funds and guidelines are provided to ensure maintenance of the toilets clean and also to water the plants in the School premises. O/o SPD, SSA, Telangana, Memo.No. 108/SSA/CW /Tl 0/2015. Date: 18-07-2016. Subject: Telangana SSA I lydcrabad - Daily Maintenance of Toilets in the Government and Local Body Schools utilizing the School Grants under SSA & RMSA during 2016-17 Guidelines Communicated - Reg. Reference: Guidelines on School Grants and daily maintenance Schools sent through email dated 05.07.2016. All the District Educational Officers and Project Officers of SSA in the Stale arc inf or med that Guidelines on School Grants and daily maintenance of toilets in the Schools have been communicated vide reference cited. A copy of the same is once again sent here with for compliance. In this connection, they arc requested to take immediate necessary action in the matter and furnish compliance report within a week to this office. i) The School Management Committee of the School may engage one local person if the School is not having any attender/part time worker. If the School is having 2 attenders (1 attender & 1 part time worker) or one attender/part time worker, then no person may be engaged. ii) An amount of Rs.25,000/- per School is allocated as School Grant to the Schools with enrollment up to 40 and Rs.30,000/- per School as School Grant to the Schools with enrollment above 40. An amount of Rs.2,000/- per month (Max) for a period of 10 months has to be paid to the person in the Schools with enrollment up to 40. 10 months has to be paid to the person. 1. The School Management Committee of the School may engage one person if the School do not have either Attender or Part time worker. 2. If the School is having two attenders ( 1 attender & 1 part time worker) or one attender/part time worker, then no person is to be engaged. 1. The School Management Committee may engage two persons if the School do not have either attender or part time worker. One person for watch & ward and the other person for cleaning of toilets. 2. If the School is having 1 part time worker/attender, then 1 person may be engaged. 3. If the School is having two attenders ( 1 attender & 1 part time worker), then no person is to be engaged. ii) An amount of Rs.50,000/- per School is allocated as School Grant to the Schools with enrollment up to 100. An amount of Rs.1,00,000/- per School is allocated as School Grant to the Schools with enrollment above 100.
iii) An amount of Rs.2,500/- per month (Max) for a period of 10 months has to be paid to the person in the Schools with enrollment up to 40. In case of the Schools with enrollment 41 to 100, Rs.3,000/- per month (Max) for a period of 10 months has to be paid to the person. In case of the Schools with enrollment above 100, Rs.3,500/- per month (Max) for a period of 10 months per person has to be paid to the persons.